Being last year’s MMFF Best Actress, Jennylyn Mercado is definitely among the most anticipated superstars to lead in a 2015 filmfest entry. Many fans and critics are now very eager to see if she will make it again this time and also if her movie will be able to make it as big as “English Only, Please” did or even better. With one of today’s most celebrated drama actors and musical performers Jericho Rosales, “#WalangForever” puts Jennylyn Mercado once again at the center stage of a rom-com setup. This MMFF movie entry has a very enticing and notable trailer. It is something to watch out for on December 25th, whether you believe or not that there is such thing as ‘eternal love’. Produced by Quantum Films with Director Dan Villegas, this romantic comedy film features a love story that reflects some of the sad realities of a lovers’ relationship. Jennylyn’s character, who is a well-known rom-com writer, in this movie is very interesting and surely, many ladies out there can easily relate to her. 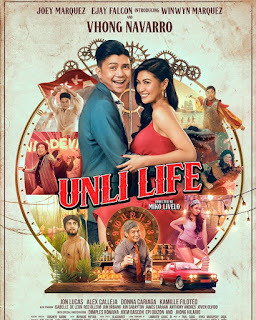 Joining the said superstars in this 2015 MMFF entry are Ms. Lorna Tolentino, Matet de Leon, Sofia Andres, Julian Estrada, Jerald Napoles, Nico Antonio, Pepe Herrera, Cai Cortez, Kim Molina, Juan Miguel Severo, and Sebastian Castro. Intense acting performances of Jennylyn and Jericho with them are highly anticipated as well, especially with Ms. Lorna Tolentino. Supposedly, it was announced earlier this year that the male lead role will be given to JM de Guzman, the “That Thing Called Tadhana” starrer. Because of the fact that his movie and “English Only, Please” were among last year’s most notable rom-com films, many fans were already excited for “#WalangForever”. However, due to the tight schedule of JM de Guzman, it was decided that he would be replaced by Jericho Rosales, who just finished his latest TV drama series “Bridges of Love”.